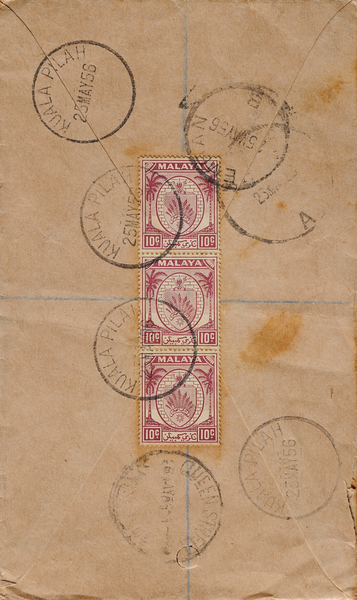 The Minangkabau people of Sumatra, who first settled in Negri Sembilan in the 14th century, were still crossing over to Malaya up to the late 1940s—another testimony to Malaya’s affinity with other parts of the archipelago. In Malaya, the immigrant Minangkabau planted rice in narrow side valleys with streams (Gullick 2003), rather than on the plains as was the usual practice in the peninsula. The most remarkable thing about Minangkabau society, however, is that it is matrilineal. Women and men are held in equally high regard. The padi (rice) stalks in Negri Sembilan’s coat of arms represent the nine Minangkabau districts of the state. The motto, in this case the state name, is embedded within the shield instead of being presented on a banner below. 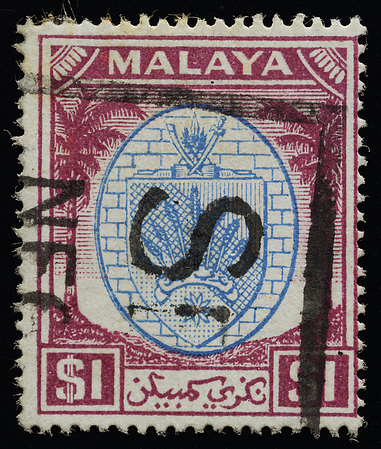 The state name therefore appears twice on the stamp. The nine-pointed star again signifies the nine districts, topped by a staff representing the Yang di-Pertuan Besar (head of state) fronted with a crossed sword and scabbard representing justice. Negri Sembilan is the only state in which the ruler is elected rather than hereditary (Hackney 1982, Holley 2010a). This is why the state’s coat of arms is shown instead of a portrait of a single man. Since 1773, the Yang di-Pertuan Besar have been chosen by a council of territorial chiefs of the more important Minangkabau districts. 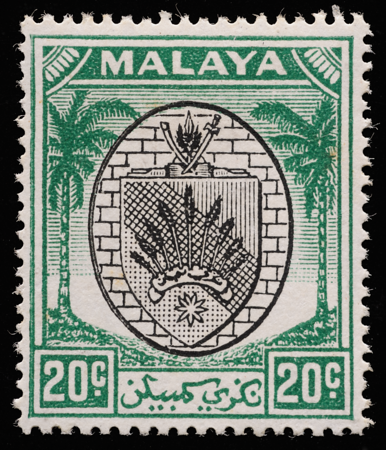 During the time of the coconut definitive, the ruler was Tuanku Abdul Rahman ibni Almarhum Tuanku Muhammad (1895–1960). 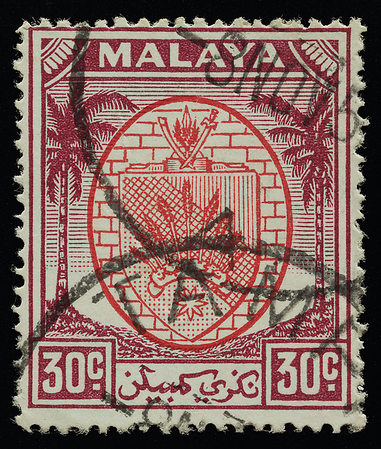 Never mind that he didn’t have the chance to appear on the stamps—he became the first king of the Federation of Malaya in 1957. The rim of the medallion sometimes appears finely bevelled on one side, like a picture frame lighted from the side. The three segments of the shield are inventively hatched, cross-hatched and dotted to correspond to the relative luminances (of red, black and yellow respectively) of the colour version of the arms. In 1952, during the tenure of the coconut definitive and at the turning point of the Malayan Emergency, Gurkhas rescued an orphaned tiger cub from the jungles of Negri Sembilan. In 1953, Negri Sembilan coconut definitives survived a plane crash.